Quince, ayva as in Turkish, is a seasonal fruit, best enjoyed from October to early January and it is plentiful in Turkey. It is a rare treat to get in England, so you can imagine my excitement seeing them at the Turkish Market in Cheam, in Southeast England. 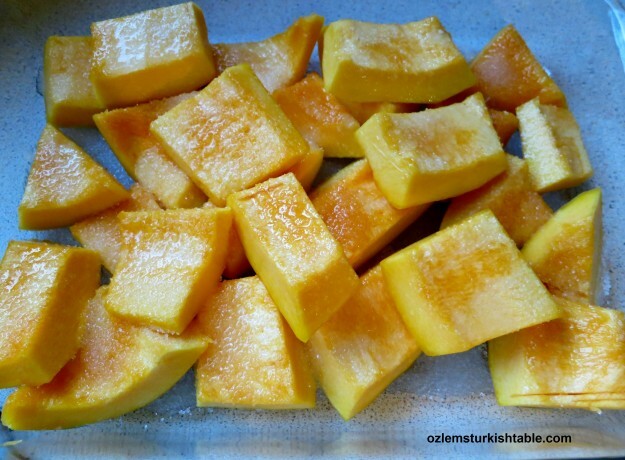 I got my quinces and my heart was set to make the much loved, delicious Turkish quince dessert, Ayva Tatlisi. 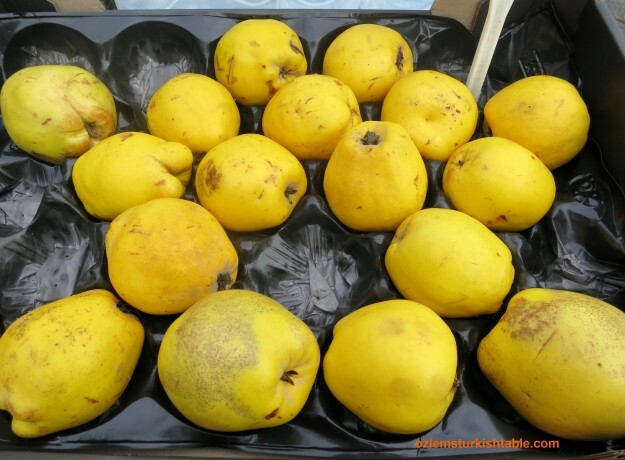 Delicious, ripe quinces at the Turkish market in Cheam, England – a delightful sight! Quince comes from the same family as apples and pears, and has a deliciously fragrant, rosy smell. There are also many health benefits of quince; it is packed with fiber, potassium and antioxidants. Quince is delicious when it’s ripe and you can enjoy eating raw, though it can also be quite tough to tackle. The hard, tangy and pale quince becomes soft, fragrant in a beautiful dark rosy pink color when it is cooked; quite a transformation for this humble fruit. 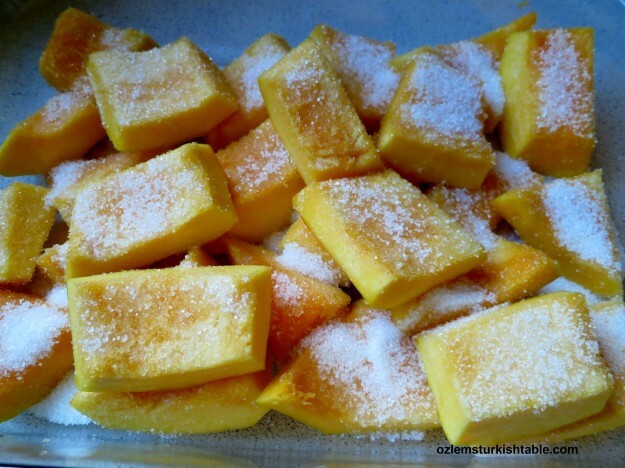 Quince dessert, Ayva Tatlisi, is very popular in Turkey enjoyed in winter time, and it is divine, when cooked properly. You may notice some of the quince desserts come up in very deep, almost artificial red color, and I am afraid that case some artificial coloring may have been added to achieve this, to save up on the cooking time. One of the elements that give this quince dessert its gorgeous color and fragrant taste is the slow, gentle cooking. 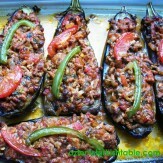 I cooked mine for about 1 hour and 20 minutes, and the transformation in the color and texture was amazing. Make sure to keep the seeds in the pan when you’re cooking the quinces; they help bringing out that gorgeous deep rosy pink/amber color. I also keep the peeled skin of quince in the pan; they all together bring a fragrant smell, beautiful color and thicken the syrup as the seeds contain pectin, a natural thickener. 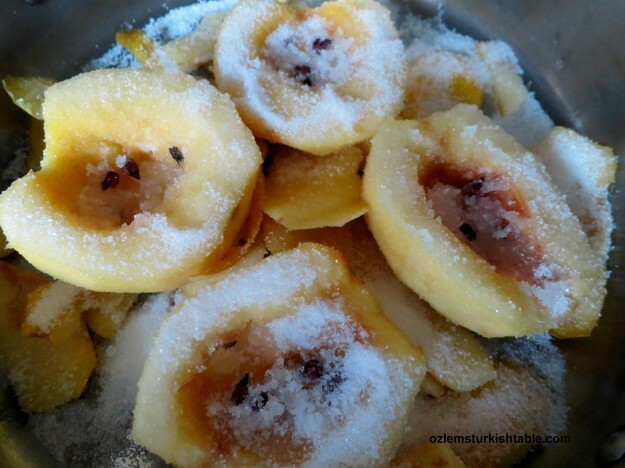 I hope you enjoy this easy and delicious quince dessert, Ayva Tatlisi; it simply melts in the mouth. You can prepare ahead of time and it keeps well in the fridge for 2-3 days. I love the fruity desserts in Turkish cuisine; they are fragrant and packed with flavor, also included in my cookery book, Ozlem’s Turkish Table, Recipes from My Homeland, available to order at this link. Wash and cut the quinces in half, from top to bottom. Scoop out the core and keep the seeds, save the seeds aside. Peel the skin of the quince halves and set them aside too. Rub the peeled quince halves with the lemon juice; that will help quince not to go dark in color. Spread the peels of quince as a layer in a heavy pan, wide enough to have 4 quince halves in one layer. Place the quince halves on top, in a way that the hollow side faces upwards. Spread the sugar evenly over the halves and stir in the reserved quince seeds, cloves and the water. The quinces will start turning to a rosy, amber color and the syrup will thicken. Bring the pan to a boil then reduce the heat to low and cover the pan. Simmer gently for about 40 minutes. Check the quinces and flip the halves gently to the other side. The quinces will start turning to a rosy, darkish pink color and the syrup will start to thicken and caramelized. Stir in the ground cinnamon, cover and cook on low heat for another 40 minutes or until the fruit is cooked (you may need a little more or less cooking time depending on the size of the quince), turn the heat off. You will now get a richer dark rosy pink color and some caramelisation. 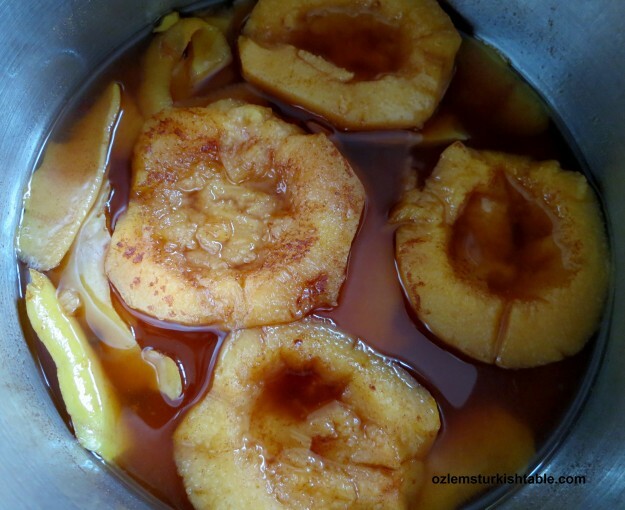 Leave the cooked quinces cool in the pan. The syrup will thicken even more and the color will go darker, thanks to the seeds acting as a natural thickener. Once cool, place the quince halves on a serving plate, with a dollop of clotted cream or even better, Turkish kaymak, the thick cream of the water buffalos over the top. 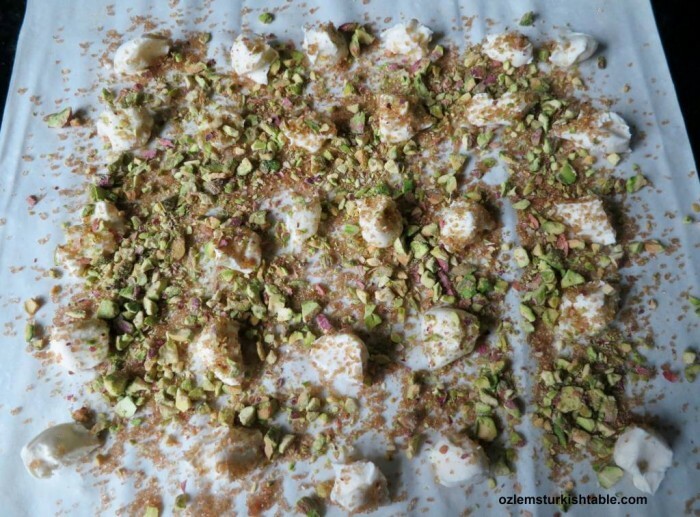 You can sprinkle some crushed pistachio or walnuts over and serve. This delicious quince dessert keeps well in the fridge for a good 3 days. 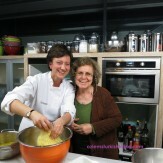 Ozlem’s Turkish Table Cookery Class at the Istanbul Culinary Institute on 19th February; Registration Started! 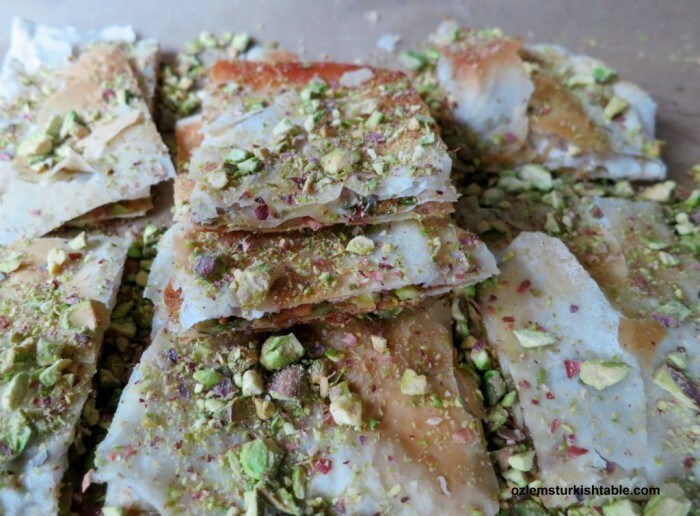 My Turkish cookery class at the Istanbul Culinary Institute is now open for registration. 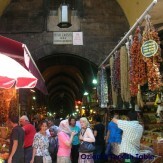 Please contact Istanbul Culinary Institute for registration, if you’d like to join us. 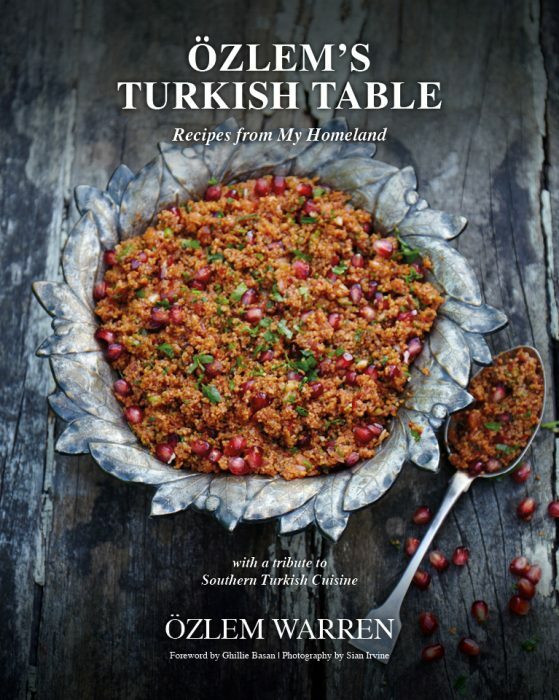 We will be talking about and showcasing the artful use of spices and prepare these delicious recipes, focusing on Southern Turkish cuisine. 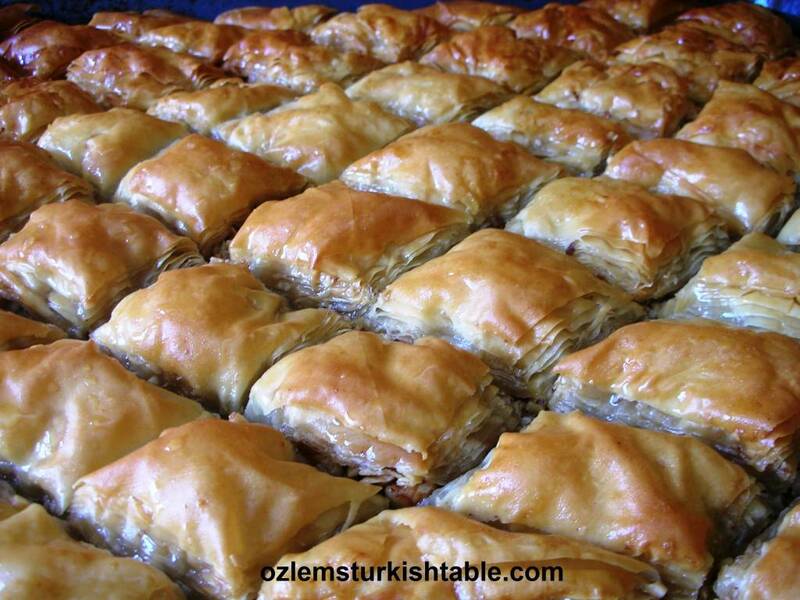 Participation is limited; hope to share a delicious Turkish bite together! We all have pumpkins in our minds at this time of the year; I love its natural sweetness and comforting, luscious flavor. 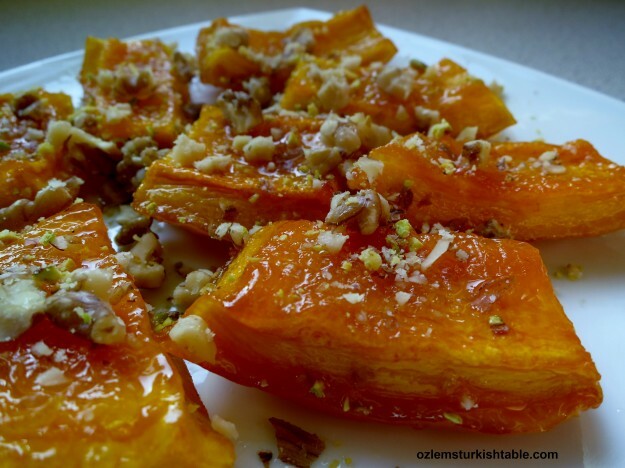 This scrumptious candied pumpkin dessert is popular in Turkey and it is so very easy to make. 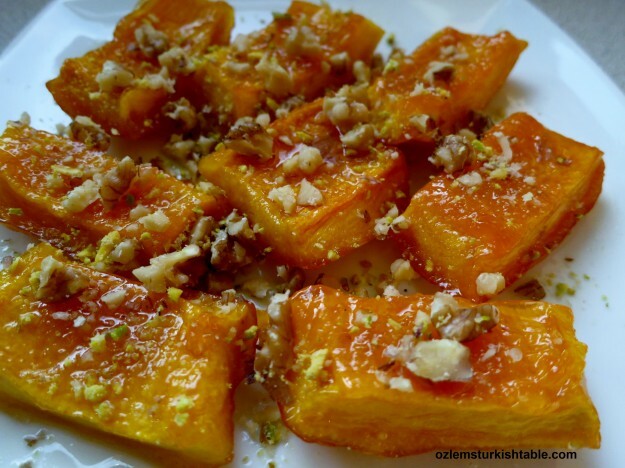 Pumpkin is baked here in its very own juice with sugar and the result is an exquisite dessert with the full flavor of pumpkin, also fancy enough to share with family and friends. 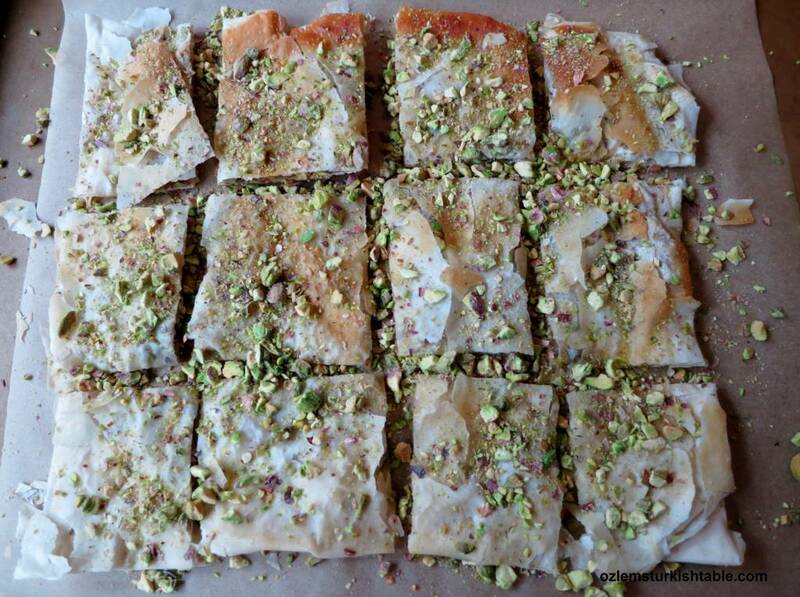 This lovely light dessert, Kabak Tatlisi, is wonderful served with crushed walnuts. 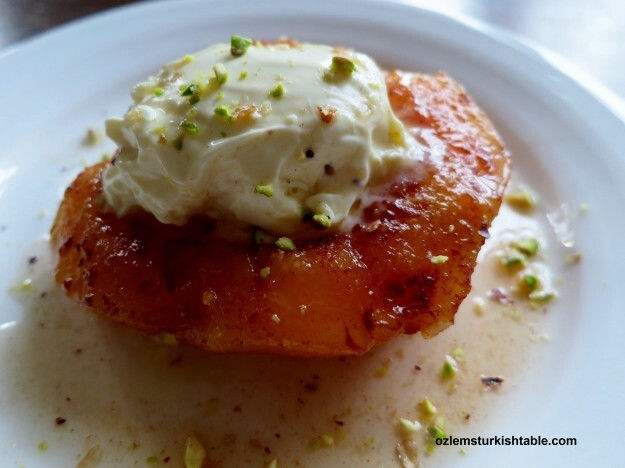 In Turkey, it is also served with our thick clotted cream, kaymak. 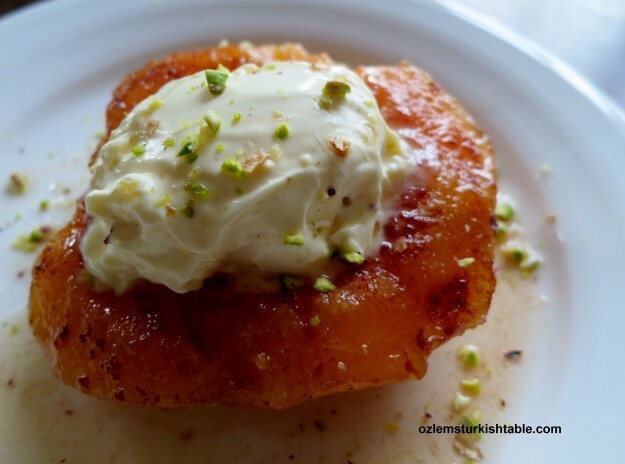 If you can’t get kaymak, clotted cream also complements this dessert well. You can also add a few cloves or cinnamon sticks to its juice before baking, if you’d like to spice up this dessert. 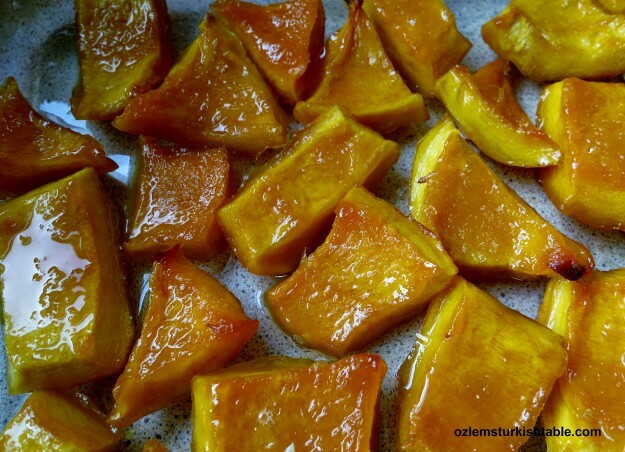 I hope you can give this delicious, glistening pumpkin dessert a try; it may also be a lovely addition for your holiday entertaining and a pleasant surprise for Halloween, if you are celebrating. Sprinkle sugar over the pumpkin pieces evenly. Line the bottom of a large baking dish with the prepared pumpkin pieces and sprinkle sugar over them evenly. Then layer the rest of the pumpkin chunks and pour the remaining sugar evenly over them. Cover the dish and let it rest overnight. Let the sugar coated pumpkin pieces rest overnight; even after 30 minutes, you notice the juices coming up. The next day, you will notice that the pumpkin has released all its juices and that the pieces are nearly covered with all that wonderful juice. This liquid is all you need to bake the pumpkin, no need to add any extra water. Baked, candied pumpkin, utterly delicious. Bake the pumpkin in the preheated oven, uncovered. Every 20 minutes, spoon the syrup in the baking dish over the pumpkin pieces so that they all absorb the syrup and start glistening. After 45 minutes of baking, check the sweetness of the pumpkin; if you like it sweeter, you can sprinkle a few more tablespoonful of sugar. Also, after 45 minutes of baking, turn the pumpkin pieces around so that all pieces keep moist with the juice. Bake for about an 1 hour to 1 ¼ hours in total, until all the syrup is absorbed and the pumpkin pieces are cooked and candied. Let the pumpkin dessert cool down. 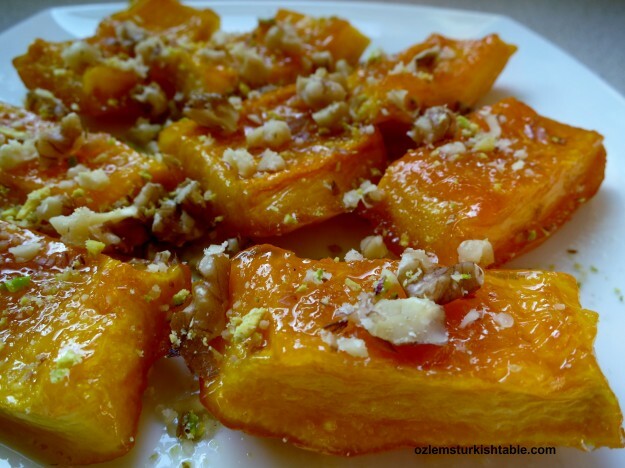 Decorate the candied pumpkin pieces with crushed walnuts just before serving; you can serve this delicious dessert as this way or also with Turkish thick clotted cream, kaymak or regular clotted cream aside.